"Most men, they'll tell you a story straight true. It won't be complicated, but it won't be interesting either." Stories are the stuff that binds generations. When we tell a tale to someone younger than we are, whether it be thrilling, scary, or inspiring, that story shapes the mind of that young person. It is something they remember. Stories communicate messages, lessons, and morals, and can simply entertain. Stories are the backbones of great films. Without them, our accomplishments and failures alike would not be captured and passed on. Understandably, many of these stories become embellished. Why tell a boring tale when it can be shaped to form a riveting one? In the case of Edward Bloom (Albert Finney), his life is defined by his stories, told in the thick drawl of a native Southerner. Much to the chagrin of his now adult son William (Billy Crudup), these stories flow like a faucet that cannot be stopped. As a child, William loved his stories�they fired his imagination and created a hero of his father. Akin to a child's realization of the truth regarding Santa Claus and the Easter Bunny, William comes to realize the falsity of his father's mythology far later in his life than he would have liked. Frankly, he has become tired of the same tales being tread and retread, especially at his own wedding. Edward's eccentric tendencies create a rift between them; William is frustrated with not knowing the truth about his father's past. When Edward's health begins to fail, William and his new bride return from their jobs in France to visit the decaying yarn-spinner and his loving wife, Sandra (Jessica Lange) in Alabama. William is about to have a son of his own, and before he does, he wants to finally understand his father, and consequently understand how he should fulfill the role of raising a child. Throughout this period, we are thrust into the dazzling world of the elderly Bloom, brought to life through imagination and a younger persona (Ewan McGregor). His tales create the penultimate modern fairy tale. As a youngster, Edward was the star of Ashton, Alabama, dominating in both sports and academics. When a giant named Karl comes into town, he charges the juggernaut to join him in the next step of his life: Bloom's hometown is too small for the both of them�it cannot contain Karl's size, nor Bloom's ambition. And so begins the journey. With this stunning confidence, partially fueled by knowing exactly how he will die, the youthful Edward touches the lives of many, and even saves a town. Of course, the fragmented description provided here only begins to scratch the surface of Edward's remarkable life, captured through his remarkable stories. The rest is for you to discover. 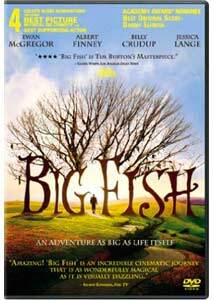 Tim Burton brings his distinctive visual style to this stunning, funny, and extremely touching film. Burton is clearly in his element here, and is able to use his imaginative power to bring to life a very personal tale of a father and son. The visuals, brilliantly illustrated by some first-rate costuming, production design, and cinematography, immersed me in this richly bizarre, yet inviting world. Its messages are timeless and universal�I can see why Burton took to this project, which for once does not include major comic book heroes or literary icons. Relationships are front and center, brought to life by some first-rate performances. Albert Finney can do no wrong, and his Edward is no exception. Finney brings a great sense of history and experience to the elderly Edward who is as passionate and motivated as his younger persona, played by Ewan McGregor. McGregor's boyish charm is present when needed, as is a palpable maturity as he begins to age. Billy Crudup does a serviceable job playing the frustrated son, whose ambition to know the truth mirrors a certain someone. Supporting members, such as the very talented Alison Lohman, Jessica Lange, Helena Bonham Carter, and Danny DeVito provide panache when needed. Steve Buscemi is especially hilarious as the temporarily lost and consequently touched poet, Winslow. Big Fish is a special film. It made me stop and consider my relationship with my father, which, like William, and any other boy who knew his father, has seen its ups and downs. When William believed that his father was nothing but a liar who made his world less boring through fish tales, he saw nothing but fraudulence. He fails to realize the definition of Myth, which does not necessarily imply something is untrue. The order and events may not always be accurate, but myths capture the truth of the event described. William comes to realize this fact, revealing his father's true nature and powerful influence. Edward has become his stories, which, when told by those who love and care for him, will make him immortal. William too will have stories to tell to his son, who will hopefully, too, see his father as larger than life. Image Transfer Review: Columbia's transfer is somewhat of a mixed bag. Most of the time, detail is very good, exhibiting bold colors, stable blacks and an all around dazzling image. At times, the picture appears soft, which looks intentional, capturing the soft glow evident throughout. However, grain does persist and becomes very noticeable is some darkly lit scenes. Edge enhancement is present at times, especially around the main titles. Overall, a solid presentation that could have been cleaner. Audio Transfer Review: The Dolby 5.1 surround mix is a dynamic, immersing mix that pulls the viewer into Burton's unique world. Surround activity is frequent and detailed. I especially like the subtle surround effects as the lures move past the camera in the opening shot. LFE makes itself known often, especially when Karl the Giant speaks or walks. This is simply a great mix that enhances the experience. Transparent keepcase with art on the back side of the cover insert, which can be seen inside the case. Extras Review: Extras are plentiful. First is an audio commentary by Tim Burton. Throughout the track, he is interviewed by another individual who poses questions and guides the conversation. Burton's comments are varied, focusing on production details, inspirations, and avoids the pitfall of excessive plot exposition. Burton's attraction to this project stemmed from his relationship with his father, who had recently died. Big Fish allowed him to endure the loss. Next is a series of seven featurettes, divided into two sections. The first section, The Character's Journey, begins with Edward Bloom at Large (08m:45s), which focuses on Ewan's stunt work throughout the film. Finney's involvement is somewhat of an afterthought in this piece. Next, Amos at the Circus (04m:37s) gives us an inside look at Danny DeVito's ringmaster Amos Calloway, and the various acts featured in the sequence. Fathers and Sons (07m:20s) features cast and crew discussing their takes on the relationship depicted in the film and their own relationships with their fathers. The second sction, entitled The Filmmaker's Path, contains four featurettes. Tim Burton: Storyteller (06m:44s) explores Burton's previous films, casting, Danny Elfman's musical contributions, and Burton's fascination with mixing fantasy and reality. A Fairytale World (09m:32s) takes us through the mythical visuals of the film, including costumes, production design, cinematography and special effects. Creature Features discusses Stan Winston's marvelous puppets seen throughout Bloom's stories. Finally, The Author's Journey addresses the challenge of translating the original novel to the screen, featuring discussions with author Daniel Wallace and screenwriter John August. These featurettes are entertaining and feature mostly interviews with a healthy dose of behind-the-scenes, on-set footage. However, I would prefer if they had assembled a single comprehensive documentary. In addition to access via traditional menus, these featurettes can be viewed by turning on an option called Fish Tales. Similar to the Follow the White Rabbit feature from the original Matrix DVD, two different icons appear throughout the film (one for The Character's Journey or The Filmmaker's Path). When selected, the viewer will be taken to a featurette that corresponds to a particular scene. This is really a needless gimmick. We're not done yet. The Finer Points—A Tim Burton Trivia Quiz challenges one's Burton knowledge. After all the questions are answered correctly, you are taken to a short, two-minute piece on the VFX work involved in the famous "time stops" sequence. A nice bonus. Tim Burton's most personal and touching work is a memorable fairy tale that details the grand life of an ambitious man, and the legacy he passes on to his son. Columbia has assembled a fine presentation of this visually stunning, meaningful work. Some stories are worth sharing over and over. Here's one to cherish.